According to my Sunset Park photo and history supplier, Tony, 4th Avenue used to be a four-lane strip, but the City cut away sidewalks to make it wider. Here's the view looking North from 55th Street. The blocks look very short, and you can see St. Michael's spire much more clearly than in the photos I've taken to try to compare. The Coliseum (on the right) is now a church, and the Philip Foffe's Vanity Fair is now a Chinese food restaurant. Anyone have other tidbits about the places that are seen here? Yes, it's great photo. I was wondering how the city turn 4 lanes into 6. Looking closely at the 53rd Street train station entrance (lower right) I saw this cut into the sidewalk. BViB, thank you and Tony for sharing. Really interesting. Did you post your comparison photos? I like the trees in the 1970s version. My shots don't do it justice because I wasn't standing in the middle of the street. :) I did check out street view on Google maps - it shows quite a difference. wow. the vanity fair is that on 53rd st? my parents own a home on that block, this picture is amazing! I lived about 1 block from where you stand while taking your photo. The Coliseum at that time was going down-hill - it had too much competition from other movie houses. People living there were becoming more venturous - going into Bay Ridge for the clubs (that really started growing in number along 3rd avenue at that time from the early 70s). The bars along 4th avenue in Sunset Park were usually dominated by "the regulars", who were the left-over tough guys. I knew many of them since childhood, but did not want to spend weekend nights with them - that's for sure. They'd get drunk and start talking about their old enemy gangs...And would occasionally try to get a group together to go out looking for them again. But, there were plenty of decent people there, and some are still there, living with their own families in their parents houses to this day. If I recall, there was a bank next to the movie theatre, and a place called Stanleys Sporting Goods was across the street from the theatre (maybe a block or two away). It was actually a store for sportsmen (at least for some time)...with hunting and fishing gear. Up into the early 60s you could still catch fish and crabs along Shore Road and the 69th Street Pier. And we ate them (and are still alive now in our 60s). in the 1960s AMF, the shipyards. The Army Terminal and other factories all closed, with the factories moving to the Southern States. And this started killing the area, as the workers were blue collar, not white collar - and could not adapt. 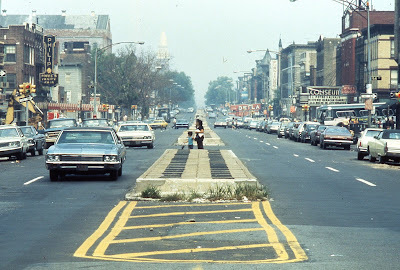 Does anyone know where there are more old photos from the 70's and 80's in Sunset Park? My husband is from there, his family is on 46th St, and previously 24th and it would be great. Looking for a good gift for him.